Details of the new Mercedes-Benz M-Class have been released and it’s substantially more economical than the outgoing model. It’s set to go on sale in early 2012, although UK specifications and pricing are as yet unavailable. The entire engine range has been overhauled to provide lower CO2 emissions and fuel consumption, with little change to performance. For example, the outgoing entry level ML300 CDI V6 has been replaced with a new four-cylinder 2.2-litre engine that produces the same power and torque as the outgoing model, but with fuel efficiency improved from 33.6mpg to 47mpg. The new mid-range ML 350 BlueTEC is more powerful than the outgoing ML 350 CDI producing 258hp compared to 231h, and it produces more torque, 620Nm versus 540Nm on the older model. Despite this it can travel around ten more miles on a gallon of diesel. Finally, the top-of- the-range ML 350 petrol engine in the new model can achieve 33.2mpg on the combined cycle, compared to the older ML 350’s 24.7mpg. Despite that the new model is almost a full second quicker to 62mph, (7.2 seconds). Again, it’s more powerful and produces more torque than the older engine. These improvements and refinements are achieved through all manner of clever tech, including new fuel injection techniques taken from the AMG performance engines, a start/stop system, weight reduction and aerodynamic refinements. Additionally, all pumps and ancillary components are activated only when they’re needed, improving efficiency. Styling is typical of the more recent Mercedes-Benz models, with beefed up, more aggressive lines and a wide, purposeful stance, accentuated by a wide front grille and a large three-pointed star. Aside from the bewildering array of gadgetry designed to improve efficiency, the new M-Class has equipment to improve handling, dynamics, refinement and comfort. The suspension uses selective damping to ensure a soft, comfortable ride at low speeds and over rough surfaces both on and off road, but to give a firmer ride and improve stability when the car is pushed hard. Along the same lines, an electronic power steering system weights the steering according to the circumstances. So on rougher surfaces the steering is lighter, but at higher speeds it weights up to improve handling. Additionally, an optional system called ON&OFFROAD allows drivers to select from six specially optimised transmission modes suited for various driving conditions, including winter weather and trailer towing. The interior can be trimmed to appeal to either sporty or luxurious tastes, and a variety of wood trims, as well as leather, ARTICO and fabric upholstery are available. The interior is more spacious than that of the outgoing model. The standard infotainment system includes a TFT screen, CD player and USB in compatibility, but can be upgraded with sat nav, a six CD changer and harmon&kardon audio. The COMAND Online system is available as an option, too, allowing users to connect to the web in car, as well as to hook their sat nav up to Google maps. 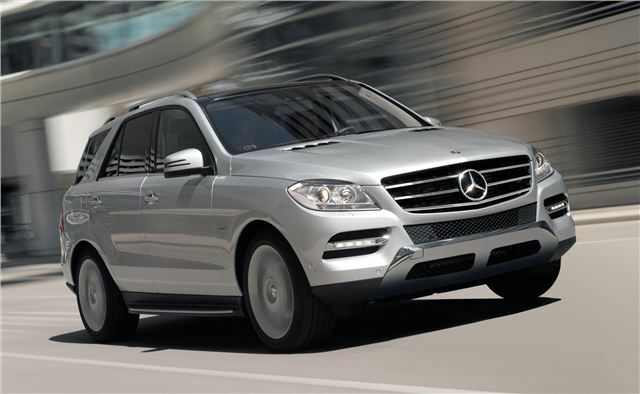 UK specific information is as yet unavailable, but the new M-Class will go on sale in the UK in early 2012.